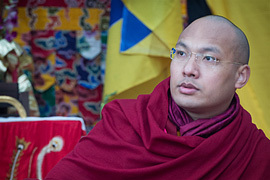 ONE EARLY MORNING [in 1980] His Holiness the Sixteenth Gyalwa Karmapa generously granted an interview to the readers of Densal. What follows is the text of that interview, word for word, as translated by Ngodup Tsering Burkhar. 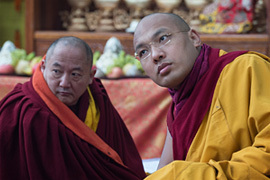 In it, His Holiness touches on many important aspects of spiritual practice, the Kagyu lineage, and life in the world today for the Dharma practitioner. It is a timely and most valuable teaching for Buddhists and non-Buddhists alike. Densal: This is your third tour to America. Do you have any observations you would like to share about it, and about the growth of the Dharma in the United States? H.H. : The responsibility of the teacher is to always give the teachings. It doesn't matter that only a short time has passed, or a long time has passed; what matters is that the teachings are continuously given. Sometimes it may seem to be more appropriate to teach because most people are at leisure and have a lot of time, and it appears to be a good time to give teachings. Maybe at other times it may appear that the teachings should not be given because people are busy and perhaps they are not interested. 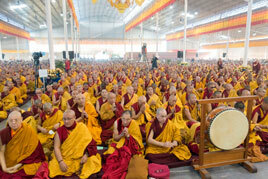 It is important not to discriminate in this way as to time or to place, but to make the teachings constantly available. If only one person is interested, the teaching must be made available. 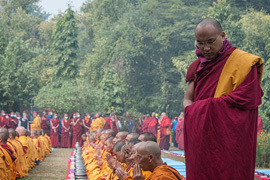 Whether there are just a few people, hundreds of people, or even millions of people interested, the Dharma teaching must go on without any sense of satisfaction or discouragement. 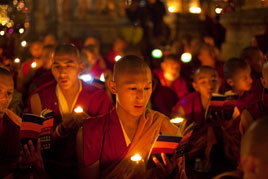 The Dharma teaching must continue at all times, transcending the appearances of the time. Another situation that might arise is that because of time or what we may have done or accomplished, we feel that maybe now we should stop practicing or listening to teachings. This is not the Dharma path. You keep going. That is the bodhisattva's way. As long as it benefits even one being you have to, without any sense of discouragement, go on. If you have 100 percent dedication and confidence in the teachings, then every living situation can be a part of the practice. You can be living the practice instead of just doing it. Regarding the establishment of the Dharma anywhere, it happens as a result of what takes place on an individual basis; it is the practitioner's responsibility. It is understanding the Dharma properly, respecting the truth of Karma, the truth of cause and effect. One respects the truth of the teachings and knows that this is something that one must live up to and preserve. But if beings fail to respect the truth of the teachings, or the truth of cause and effect, which is also the truth of the teachings, then that would not further the establishment of the Dharma. Densal: More than anything I think one problem Westerners in the Dharma face is the desire to achieve ultimate spiritual realization in this life, coupled with the fact that they must work full-time in the world at various time-consuming careers. How can one handle this life situation and travel the Mahamudra path effectively? It has been said that action can also be meditation. Could you please clarify this? H.H. : We have for many, many lifetimes been caught up in the samsaric existence because of fascination with our habitual patterns, and are compelled for this reason to continue the patterns in the same way that we had in the past. At this time in our lives, as a result of whatever virtuous actions that we have formerly performed, some degree of awakening has arisen. A very precious waking state has come about in our consciousness, and that is our connection with the Dharma. 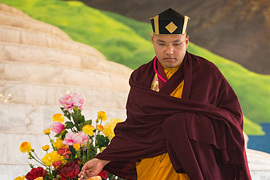 Once we are connected with the Dharma in such a way that we have some understanding, we also have some sense of direction as to where we are going. It is like wanting to go to California. You know that there is a particular train, and that train takes you to California. You have that understanding. Then it becomes a matter of individual realization of the need, the urgent need perhaps, to get to California. Then there is boarding the train. It is possible for one to do such a thing, to make the decision, "Yes, this is it, I am going to travel." And there is the greater possibility that you will get to California once you have boarded the train. And maybe there are certain possibilities of your not getting there, of something happening on the way. And if something happens on the way, an accident or something, you know that the possibilities of getting to California are still there. You haven't yet reached it, but you have some sense of direction as far as your knowing that it is possible to get there. And this is, one could say, like the blessings of the Dharma: that even though one is not able to realize enlightenment in one lifetime, the blessings of the practice and the Dharma are continuous. There is a sense of optimism about the possibilities of getting to California, even though you haven't arrived. That is the same situation that takes place in your Dharma life. The blessings continue, even though you could not attain the experience of enlightenment in this lifetime. If you have a proper direction, in the state of the Bardo, there occurs what is like the meeting of the mother and son. It is an opportunity to rely on your own ability to understand and to realize, and utilize the Dharma blessings at that moment in the Bardo in order to recognize the "mother," so to speak. Your experience of clear light takes place. And realization is very much possible. This has been witnessed by the teaching and is guaranteed by the teaching. It is definitely possible for people to experience that sort of thing. Densal: Even though people find themselves caught up in a samsaric whirlwind, they can maintain their equanimity and attain the realization in Mahamudra? H.H. : Yes, it is possible. It is a matter of confidence in the teachings. 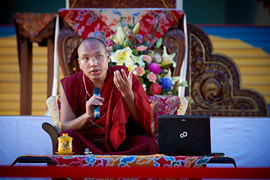 If you have 100 percent confidence in the teachings, your realization is not purely dependent on just formal practices. If you have 100 percent dedication and confidence in the teachings, then every living situation can be a part of the practice. You can be living the practice, instead of just doing it. But the more you lack the confidence, the more you will find yourself separated from the Dharma. 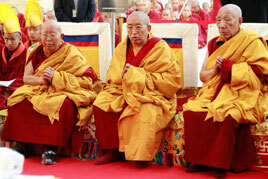 Densal: Part of the training within the Kagyu lineage is the three-year, three-month retreat. At KTD already there is one nun in such a retreat. Does the monastery project include plans for a three-year retreat center here in the U.S.? And could you explain how the three-year retreat relates to the American people, many of whom are oriented toward activity and have difficulty in seeing the practicality of such an undertaking? H.H. 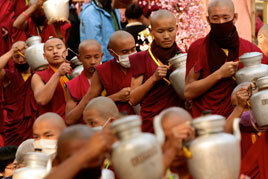 : Actually the monastery project itself is to facilitate the practice. 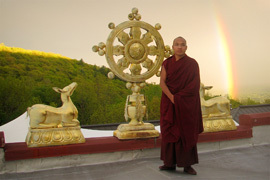 The purpose of the monastery is to be able to help create a proper environment, to establish a solid, structured environment for the practice of the Dharma. And the practices of the three-year retreat are definitely included. Not only are they included as far as the outer facilities are concerned, but in terms of providing the basic needs. I have in mind much concern as to how that could be worked out. Before I leave this country, it is my plan and vision to talk to many people about this, to awaken their interest and make Dharma benefactors aware of the situation. If they could help and support the three-year retreat, it would be very beneficial for them, though they themselves might not be able to do the three-year retreat. They will actually accumulate equal benefit, as much as those who will do the three-year retreat. As far as those who are able to do the retreat are concerned, of course they will have tremendous benefit coming as a result of the practice. And it is also my vision that gradually people will find more time in their lives to do retreat, as we are able to provide the facilities for people to take advantage of. Unlike some time ago, we now see many people trying to make time for the practice, and many are seeing the possibility for making time. There is much more interest. I see in the future many people doing these kinds of practices, and they will be given the opportunities to do them. For those who are not able to do it, it is possible for equal experiences to be achieved. The thing is that during the three-year retreat, one does a lot of meditation practices: the fulfillment-stage and development-stage meditation practices, and the recitation of the mantras, and many other things. No matter how ignorant a person is, it is guaranteed that the three-year practice will bring a reasonable experience of the teachings to the mind of the person. The retreat situation involves relating to the preliminary practices as well as the main practices, and when one has that kind of grasp of both the preliminary and the main practices, certain experience is guaranteed. Now, if someone has a greater wisdom and capacity for penetrating the teaching, then even without doing a three-year retreat, it is possible for one to experience definite understanding and realization. Densal: Do you see more Westerners being trained as qualified teachers and holders of the lineage? H.H. : Yes, I feel it is important that people become able to take care of the Dharma, and are not always in a position of dependence. I am confident that we will be able to produce such teachers, and producing such people is very important. 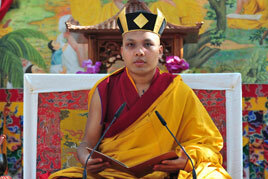 Densal: You are the recognized head of an important lineage, the guru to many thousands of people. 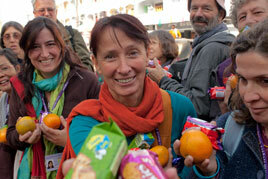 There are frequently misconceptions about what a spiritual teacher is in this tradition. Could you explain, in your own words, what is the guru? H.H. : I will tell you what a guru is not. 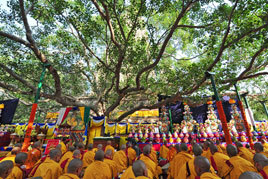 That is, somebody who is interested in fame, teaching for the sake of notoriety, for the sake of wealth; or one who, when he is in the presence of many people, puts on all the qualities of goodness that might be appropriate for a teacher: wearing the mask of the Dharma, so to speak, using whatever appearances are necessary, but insincerely. The reality is much different. When he is away from a crowd of people, he actually needs as much as anyone else needs, wants as much as anyone else wants, if not more. Discrimination between beings, selfishness, all these negative states are present in him, and have not been transformed. That is, unfortunately, what takes place too frequently these days, and that brings a negative influence to the spiritual path and spiritual friends in general. It fosters a negative view altogether among people who are ignorant as far as who should be regarded a true guru. They might encounter someone who is a true teacher, but they fail to relate to him because of having gone through other experiences of the negative nature I have already explained. Now these days, actually, to encounter a very true guru is difficult. So if you encounter a spiritual friend who is a guru, look to see that he is willing to help himself at the same time that he is willing to help you; also, if he is capable of helping you. He should have a desire to help you as much as he helps himself. In times like these, such a one may be considered a spiritual friend. The actual quality of a guru should be a willingness to work for the benefit of others, along with the ability to work for the benefit of others. And there are different levels of gurus, as well. There are different degrees of being able to benefit others, different degrees of having the strength and the wisdom to reach beings. It is difficult, then, to be specific about qualities of gurus, yet we can come to the conclusion that as long as the teacher is selflessly benefiting beings somewhere, that this person may be worthwhile to be recognized as a spiritual friend and as a guru. 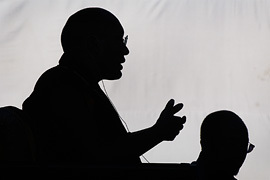 Densal: Your Holiness, do you have any special message you would like to give to your students, disciples, and interested people who will read this newsletter; some advice, perhaps, in these difficult times? H.H. 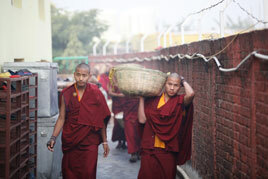 : The practice of the Dharma is a matter of serious importance; people have to realize that. It is a precious opportunity that has come about, one that has never come about before. It is very precious because it is so rare. The time in which you can use the opportunity is quite limited, and this makes it even more precious. I would like to repeat that a rare and precious opportunity which has never come before has manifested when you find the Dharma in your life. It is a historic situation, a landmark. But the time to take advantage of this opportunity, again, is limited. Therefore we have to realize the great value of the opportunity. 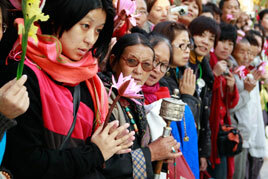 The best way to do this is to engage oneself in the practice of the Dharma as sincerely as possible. Otherwise the opportunity could fade away. There is this danger, most certainly, that one could lose this opportunity. It could become more and more distant, and this would be a very unfortunate situation. It is like crystals that are put together with a piece of a diamond in the same container. They are all regarded as the same. They are neglected, dust settles on them, and they cannot be appreciated any more. But if, on the other hand, they are cleaned and the diamond is placed on a gold stand with light shining on it, then you will, of course, be able to appreciate it. You will see very clearly that it is a diamond, and that it is not an ordinary crystal. That degree of understanding and recognition is very important. Now, in sincerely practicing and studying the Dharma, whatever particular line of study and practice one is pursuing, it is important to retain respect for other schools and religions. 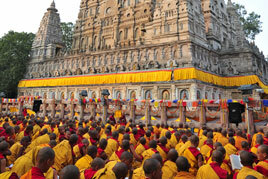 An example can be found in Buddhism itself, where people try to discriminate between Hinayana and Mahayana. That is very much against the Dharma, an entirely wrong view. 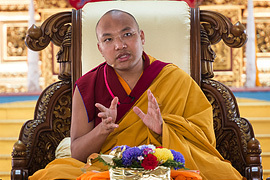 One must have equal respect for the Hinayana as well as the Mahayana teachings. Also respect is necessary for the established religions, the religions that have been prevalent in this country for hundreds of years. These religions have played a significant part in the lives of many people. If one is going to practice some other religion, it must not be in denial of any existing religion. One has freedom of religion, freedom of practice, and so one chooses to practice a particular faith. But that choice must not include rejection, denial, or a sectarian disrespect for other paths. 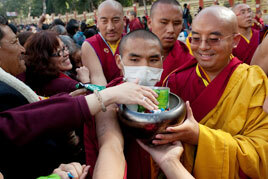 That is not in accordance with the practice of the Dharma. Since an individual does have the freedom to choose, however, it is important to commit oneself to a particular spiritual practice and teacher, taking advantage of the teachings and practices that one receives, and being oneself worthy of the teachings through one's continuous practice. There is even the possibility of certain students becoming more realized than their teachers. This can happen. So one can see possibilities and take advantage of them, knowing that one has the ability to actually master the teaching. Having a very definite relationship with the teacher, the teaching, and putting effort into studying is essential if one wishes any attainment. It is not done out of or sectarianism. If one goes to a teacher and tries to study and practice a little bit, then goes to another and does the same, one would not experience definite improvement and success. So from that perspective, consistently relating to a particular line of practice and teachings is vital. Densal: Do you see this training in an established religion as a good ground foundation for one who then chooses the Buddhist path? H.H. : There is a general benefit in all practices as long as they have a religious or spiritual orientation, and as long as the tenets of the tradition are followed. It is in some way or another beneficial. But it is a different path. Again, respecting all schools of teachings is important, be it Buddhism or any other. At the same time, you are free to choose. Choose a path with a meaningful experience in mind. For instance, if something tastes sour, you will want to taste its sourness, or if it is sweet or bitter you also will want to be able to taste it. Whatever practice you do, do it to the point of being able to experience its essence. Experiencing is very important. To develop a capacity for experiencing, a relationship with a particular teaching and practice is needed. One of the reasons all the criticism comes from people is because they are so impatient and so confused that they go here and there, they try to relate to a teaching, get infatuated and try to do something fast, and they don't get anything reasonably understood, achieve any experience. How could they? How could they experience anything? So they go to another place and spend some time, a short time, and expect that something will happen immediately. If it is a true path and a true teaching, it doesn't come about just like that. It takes time. 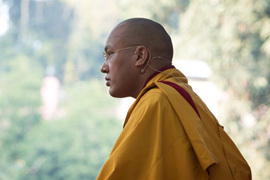 The Mahayana teaching, for instance, is very precious. It takes a lot of output in the way of your sincerity, your commitment, and your genuineness. It doesn't happen instantly. It is not that cheap. So then what happens is you start criticizing this or that particular school, saying that it is not worthwhile, the practice is not good, or the teaching is not good, or whatever. You don't have any ground for criticism. And besides, having such an unhealthy attitude does one no good at all. Such an unhealthy attitude expressed in the open causes a lot of harm not only to yourself but to others. You place obstacles in the path of others who are making attempts to connect themselves to some kind of higher teaching. So that becomes a problem. Along with devotion to your study and practice, and sincere openness toward others, there is another attitude to maintain: simply, no political games. That is, not going about with a friendly appearance on the outside, while inside it is something else again. Outwardly and inwardly you must lend whatever friendship and support to others that you are able, and at the same time do your practice. Respect and live your own life, and do your own practice properly. You have to have some confidence and trust in the teaching and a sense of commitment, which is like surrendering to the teaching. That is absolutely important. It does not come in an easy way. So what I would like to get across is this: people enter the Mahayana path and expect some instant realization, without having any confidence in the teaching, any respect toward the teaching, or any genuine commitment, and they are under a serious misunderstanding. If your commitment is sincere, and you have genuine confidence and trust, then something can take place in the way of experience. The validity of the teaching is witnessed by thousands of years of practice and continuity. If you cannot have trust and confidence, then I can frankly say that you are fooling yourself. You must have a certain amount of patience, a certain amount of confidence. The greater the confidence and trust that you are able to have, the quicker your realization, and within one lifetime you could make a significant achievement and experience a satisfactory realization. It is something that you could feel was worth all the time and energy that you put into it. If you are able to have total trust and confidence and exert yourself, then definitely within one lifetime you could have an extraordinarily meaningful accomplishment. If you are not able to have total trust, but have some, and also do some practice, even then you can achieve something. 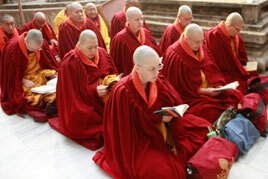 You have heard as well as seen monks who have done some practices, but in their daily life you do not see anything different about them, until they die and sit in meditation for three days after death. If not during one's lifetime, there is a point during the bardo when there occurs a very pure moment. When that very complete, clear moment arises, the ability you have developed may bring the realization of a higher state of mind. The third thing that I would like to say is that people have to definitely work and support themselves. When you have the enlightened attitude you have a responsibility to the people around you, to your country. You care about them. You are always with your practice, you are inseparable from it, you seize opportunities to benefit others and you will benefit others in whatever way you can. You have been in this country, you were born in this country. Many people who will read this are from families that have been here for generations. This country has been an important place for you. You have to offer respect for your grandparents, and you must live a decent life, a dignified life that upholds the traditions of your ancestors, that meets the approval of society, your parents, and yourself. Also you have to set a decent and dignified example for generations to come. If you are really going to serve this country and help its people, this seems like a reasonable way, rather than belonging to this party and that party, and getting involved in this competition and that competition, and all kinds of politics. As practitioners of the Dharma we don't have to deny politics and reject politics, but we don't have to play those games, either. It is not necessary, it is not important, it is not needed. If you are working maybe in a hospital, you can see how you might have the opportunity and responsibility to help people. In the same way, whatever work you have taken, there are definitely people that you can benefit. So you should serve your people, serve your country, not expecting your country to serve you. And that's part of the practice of the Dharma. Not working is not taking responsibility. If you are a practitioner of the Dharma practicing the Mahayana teachings, that means you have something to be proud of, something to be worthy of, something to be decent about. But many people go around like some kind of outcast. That is not in accordance with the teaching, to come on like some kind of outcast, in rags, with long hair, unwashed, as if you are a drug addict or something. This is not the proper way to present yourself. You are not maintaining self respect, you are not respecting the Dharma that you are practicing, and you are not creating the proper outlook that the excellent Dharma is worthy of. This is the message to the practitioners of the Dharma: that they must be dignified internally as well as externally, and that their internal dignity must reflect outwardly also. We are not drug addicts. Wearing decent clothes, and being a decent human being, and serving your country, your people, serving the Dharma, and also yourself, being a self-respecting person is the Dharma path. How are you to benefit beings by looking as if you are completely discarded from the society? By putting forth that appearance, you are not being responsible or reflecting the enlightened attitude. If you are practicing the enlightened attitude, you should naturally be able to attract people so that seeing you, people might think, "Yes, these people definitely seem to be decent people, I think I could relate to them, and could ask something of these people. They might even be able to help me." So that you appear capable of giving help, or at least capable of giving some direction toward help. 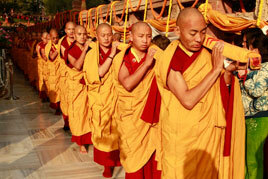 We are proud of ourselves as examples of the Dharma. 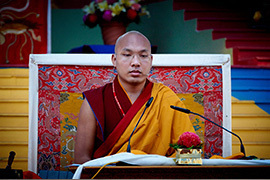 If you are going around in rags, not taking care of your body, and going in the world like a misfit, it makes a very bad impression of you, of the Dharma center that you are involved with, and also of you as a person of this country, which means that you bring disrespect and a bad impression to this country and its people. These are certain points that before I leave I would like to offer for people to use. I hope that whoever hears these words, whether you are a Dharma practitioner or not, or involved in Buddhism or not, that it will make some sense to you. It comes sincerely and truly, not with any put-on, or masquerade or diplomacy, but truly straight and clean. With integrity and sincerity you can serve beings, and as you work in the Dharma you will serve many beings, and that is the greatness of the Mahayana teaching and practice. You don't have to be a dropout from the community, the society or the family. You are not. You have dignity.